I’m working on a music video in which the opening shot contains a 3D scene. I’m wondering if anyone is able to make it look like a nicer smoother and more realistic night scene. My main concern at the moment is the gross looking grass and some of the more unrealistic textures. Plus the lighting could be a lot nicer and match the footage better. The way I’m going to composite is by doing another run using just the front of the house and using it as a matte. As far as lighting goes feel free to play around and get as artsy as you want! It’d be awesome if there was some mixed lighting going on between tungsten and cool moon light. The camera has been motion tracked to the scene and parented to a hidden cube in the middle, but I’m planning to maybe re-track so please try and work around the general positioning of things, but if you can justify changing the scale or something then go for it and just let me know. When it comes to re-texturing feel free to completely replace as many textures as you want. Just please make the door pink. Sorry about the structure of this file, it’s a mess and that’s because I’m really not great at blender. Please try your best to capture night time suburbia. 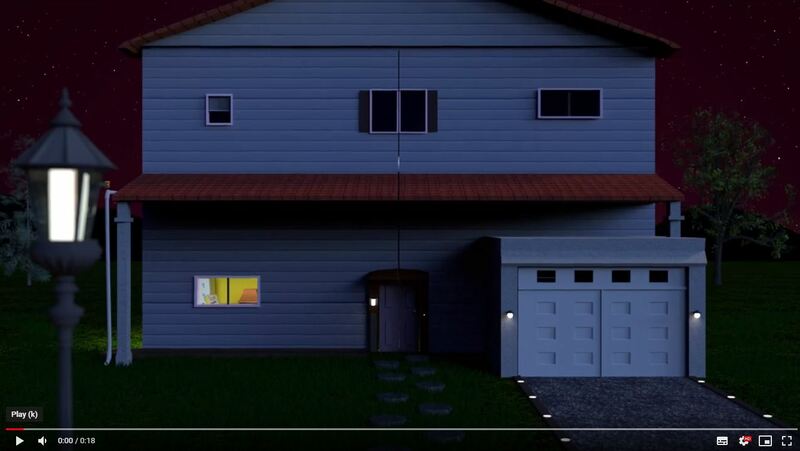 Brownie points for adding extra assets to make the scene seem more like a house in the suburbs. I’ve included a very basic test render of what it might look like and the general aim of the shot. The lighting at the moment is done with an HDR. The whole thing might be too small, not sure if that affects it? Please have fun with it! The files can be found for download here: EDIT: LINK IS NOW INACTIVE Please upload anything you have made in your own folder in “blenderartists”. I look forward to seeing what you come up with and thank you in advance! Please supply me with your details if you choose to do this so that I can add you into the credits! Hi, by when do you want it? I’m still in high school so i can only work on it on weekends. I’ve been doing blender for almost 2 years. I’ve never done volunteer work, just looking for experience.